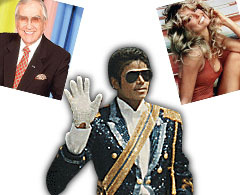 President repeals Celebrity Death Rule after it leads to 'inadvertent' demise of megastar Michael Jackson. Kicking the bucket in clusters of three, a popular celebrity pastime in recent decades, was officially outlawed today. At a White House ceremony attended by Amy Winehouse, Keith Richards and Tracy Morgan, President Obama signed an executive order making back-to-back famous deaths punishable by fines up to $10,000 and/or six months in jail. "The Celebrity Death Rule was well-intentioned and innovative for its time," Obama said. "But over the years, it has become riddled with problems." In addition to a confusing formula for determining star status (Ed McMahon, yes; Seeds singer Sky Saxon, no), the rule placed "unfair burdens on the news media, forcing journalists to prepare multiple heartfelt TV and newspaper tributes in a short time period," the president said. The rule of three was also error-prone. In an interview with TMZ.com, the Grim Reaper admitted that pop star Michael Jackson's death was inadvertent: "After icing Farrah Fawcett and Ed McMahon, I stopped off at the Beverly Hills Home Depot to pick up a new scythe, then headed toward my last appointment  a lunch date with Hugh Hefner. But I got stuck in traffic, realized my shift was ending and panicked. Unfortunately for Michael, he was the nearest megastar on my GPS. What makes it worse is that I totally forgot about killing David Carradine a couple of weeks earlier, which means I didn't even need a third corpse to meet quota. My bad."